On the 24-26th of May 2018, Cees Withagen, Eric Strobl and myself are organizing again the environmental economics part of the annual IPAG conference ISEFI in Paris, France. Keynote speakers are Robert Pindyck and Rick van der Ploeg. If you have any questions or thoughts, please do not hesitate to drop me a line on ingmar.schumacher@ipag.fr. In this article we investigate the role that internal and external conflict plays for optimal climate and immigration policy. Reviewing the empirical literature, we put forward five theses regarding the link between climate change, migration, and conflict. Based on these theses, we then develop a theoretical model in which we take the perspective of the North who unilaterally chooses the number of immigrants from a pool of potential migrants that is endogenously determined by the extent of climate change. Accepting these migrants allows increases in local production which not only increases climate change but also gives rise to internal conflicts. In addition, those potential migrants that want to move due to climate change but that are not allowed to immigrate may induce external conflict. While we show that the external and internal conflict play a significant yet decisively different role, it is the co-existence of both conflicts that makes policy making difficult. Considering only one conflict induces significant immigration but no mitigation. Allowing for both types of conflict, then depending on parameters, either a steady state without immigration but with mitigation will be optimal, or a steady state with a larger number of immigrants but less mitigation. Furthermore, we find the possibility of Skiba points, signaling that optimal policy depends on initial conditions, too. During transition we examine the substitutability and complementarity between the mitigation and immigration policy. You can find the full paper HERE. In a post during the next days I hope to write a more policy-oriented view of this topic. How green is Germany’s consumption? Germany is without doubt one of the green role models that the world is looking at, especially with respect to its energiewende. But how green is Germany really? 7 things we’ve learned about Earth since the last Earth Day – nice points made over at VOX. Some satellite images show how humans altered the landscape. Scary are how the rainforests get reduced by farms in Brazil, while it is interesting to see how Ukraine’s landscape recovered after Chernobyl. What bees and voting have in common according to Marginal Revolution. Alex Tabarrok argues that quadratic voting could help to convey the intensity of one’s choices. In my opinion this comes very close to simply saying people have a financial budget that they can allocate to voting. This thus more reasily helps to equalize marginal benefits and costs, which simply gives more information than the traditional `one (wo)man – one vote’ principle. Is acting green simply a “drop in a bucket”? I have been visiting Matthew Kahn’s blog again, and he always provides interesting thoughts and opinions for environmental economists. This time he suggests that it is useless for the individual to act green since the overall impact is negligible, or, in his words, a “drop in a bucket”. To be fair, he uses this argument for economists that decide not to go to international conference for environmental reasons (carbon footprint), but his argument is certainly applicable to most green activities of individuals. Here is why I do not like this sort of argument: So yes, he is correct from the perspective of a single person. If I decide to not fly then my impact on the world’s GHG emissions is so close to zero that any cost accruing to me should outweigh the benefits. Hence, if I were to rely on a standard Cost-Benefit Analysis using only self-centred preferences, then I should always fly and never act green (unless the green activity is an in-my-backyard activity). Of course, much of the public good literature suggests this is precisely the reason for which public goods tend to be underprovided. But, obviously, in reality individuals are well-aware that their actions do have an impact well-above the immediate one, and this may be the reason for which they actually act green. One of these indirect impacts is, for example, a potential spillover effect, or network effect, which then induces others to think more carefully about their own choices, too. This spillover effect may be sizable, and there is a growing literature that studies this transmission of green behavior across generations or networks. The basic result of that literature is that, if there are enough individuals who actually do act green, then their actions may induce further green behavior by others and subsequently we may become a society that is strongly green oriented. But, more importantly, an argument as the one raised by Matthew Kahn is dangerous insofar as it implies that green action by individuals is not worthwhile at all. If people start to believe this, then they will tune down their pro-environmental attitude, and instead expect the government to take over the role of the green actor. Of course, everyone is becoming more and more aware that, without a sufficiently strong grassroots movement, e.g. in the form of Agenda 21, it is undoubtedly clear that we would ruin this planet even faster than we currently are. So folks, this is it. Anyone who ever thought it was impossible, there isn’t enough space, it is too expensive, or whatever other unreasonable argument was ever forwarded: The #energiewende is there, it is not only happening in Germany but worldwide. Take a look at Figure 1 below. 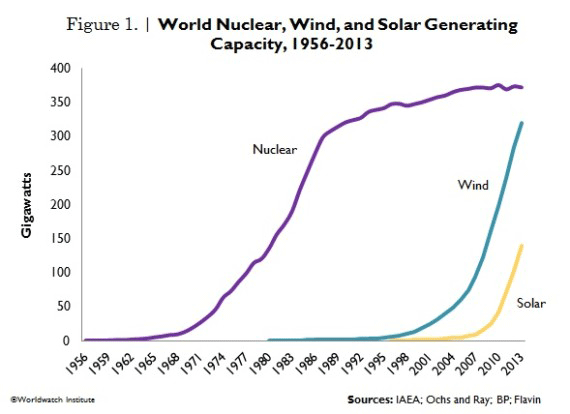 Nuclear energy production is stagnating, and that for more or less the past 30 years, while alternative sources of energy, wind and solar, are now nearly producing the same amount of electricity as nuclear is. This should be a slap in the face for all doubters, for all naysayers and pessimists alike. We do not need nuclear energy, we have safe alternative sources of energy, they are able to produce the same amount of electricity as nuclear is, and if they keep growing just for a little while longer as they have been growing during the past couple of years, then we won’t need nuclear energy in our future energy mix at all. And we might even be able to significantly reduce non-renewable sources of electricity production. Has anyone seen a significant drag on economic growth from this #energiewende? Has anyone noticed a significant increase in unemployment? Where are the promised recessions, where are the masses of job losses, productivity reductions and losses in international competitiveness that we were promised if we were ever moving to greener sources of electricity production? Anyone? Honestly, the only recessions, the only losses in employment, the only high costs that we know about come from the financial world, from rich people juggling around billions of dollars a day to take advantage of minimal spreads in the name of economic growth; from the banks that try to push up their return on assets and sell us mortgage-backed securities based on worthless mortgages and that do more shadow banking than actual banking; from companies that try to make us believe that we need to buy more and more in order to become happier, better people. Is that really how it should be? Are we really barking up the right tree if we are anti-green? Do we not lose sight of where the real costs are? After all, we should remember that our economic system is part of the natural environment, and not the other way around.